A clinical psychologist who is also a stepmother shares her secrets to forging a relationship with a stepchild. Her book has a refreshing message--that it is possible to achieve long-lasting, rewarding relationships when you "inherit" children along with a new spouse. For stepfamilies, getting married is the easy part! This encouraging guide will help couples work together to raise children in the challenging stepfamily environment. They will also learn how to use powerful communication and negotiation skills to strengthen marriage and family. Written for parents and stepparents to use together, this book combines the knowledge of Active Parenting author Michael Popkin and stepfamily expert Elizabeth Einstein. While some kids have a family tree, we have a family forest! Do you have half-sisters, big brothers, step-parents? The modern family comes in all shapes and sizes. 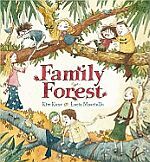 This gentle and witty picture book looks at one such family. Designed to help children express feelings about the changes in their lives to help family members understand each other better and build bonds based on mutual respect and trust. Aussie author. "For all the kids who wonder how the jigsaw puzzle pieces of their newly combined family will ever fit together," MacGregor has created another warm and understanding resource for children of divorce. Jigsaw Puzzle Family helps kids realize they're not alone -- many other kids are dealing with a new stepparent, new stepbrothers and/or stepsisters, a new house with new rules. Readers will find engaging stories of children facing the same issues, dozens of practical and helpful suggestions for making stepfamily life better, gentle guidance in understanding the mixed feelings that go with fitting into a blended "jigsaw puzzle" family, and lots of reassurance that time will help. Psychologist Carl E. Pickhardt offers common-sense advice to stepfathers on practicing tolerance and making compromises in order to establish oneself as a benefit to the family structure. His book maintains that it is possible to be an effective stepfather and maintain a healthy marriage at the same time. Takes a practical and sympathetic look at the problems of stepfamilies, focusing on ways that a stepfamily can become a workable, nurturing unit, without ignoring the reality that there are forces that can pull family members in different directions. Looks at issues stepfamilies face, including access and custody, discipline, maintenance, jealousy, different habits, finances, roles, building relationships with stepchildren, ex-partners, adoption, grief, lack of appreciation and lack of previous parenting experience. There are two new chapters in the Second Edition. One looks at the possible roles a stepparent can choose to have with their stepchildren, and the other looks at understanding adolescent stepchildren from a developmental perspective. A workable, rewarding stepfamily takes time to develop, but the author believes that stepfamilies can offer a wide range of experience and support to all their family members. Making two homes for your child. A complete guide for parents who are separated, divorced, or remarried, this book has become a classic over two decades. This book looks at the needs of all concerned with creative options and commonsense advise in the legal, emotional, and practical realities of creating two happy and stable homes for your children. Once the bliss of a newfound relationship wears off a little, the reality of being part of a stepfamily sets in. Different parenting styles, finances, relationships with ex-spouses, legal matters, and even seemingly simple issues such as the kinds of chores assigned to children can chisel away at your union if you don't always make your marriage a priority. This book offers tips and strategies on dealing with the issues remarried couples face, with a wealth of advice from real-life stepcouples. Make "us" time for talking, problem-solving, weekends away, and enjoying your marriage to constantly renew and strengthen your bond as a couple. Stepfamily life is different, and therefore different solutions are needed to get it 'on track' - and, more importantly, to help it survive. In this reassuring and straightforward book, Margaret Newman considers a wide range of stepfamily scenarios, and gives practical suggestions as to what to do in each case to overcome any difficulties. Stepfamily Life helps the reader to understand the dynamics of life in a stepfamily - what lies beneath the surface - and how to rationally approach each family issue concerning adults and children. Margaret Newman highlights the fact that while skills such as communication are very important, so too is self-awareness and a basic knowledge of family life. Using case studies and the experience of working with a broad range of stepfamily situations, Margaret Newman examines problem areas and explains what is happening and what to do about it. She shows how, despite the obstacles, a happy stepfamily life can be achieved. Copyright © 2019, Peoplemaking. Page dynamically created on April 20th, 2019, in 0.002 secs.